I had the privilege of joining Ryan Kerrigan’s Blitz for the Better Foundation Board in 2015, only two (2) years after it was established. With a focus of providing seriously ill, special needs, and physically challenged children with support, resources, daily encouragement, and life changing experiences, I soon discovered I had joined a dynamic organization with an incredibly involved Board that is truly dedicated to making a positive impact in people’s lives. Ryan’s mission started with a defined purpose as a result of his, and a family member’s, personal circumstances. Since my involvement with Ryan’s foundation, I have witnessed firsthand the incredible passion and dedication of Ryan and the extreme efforts that he has made to make a real difference in the world. He has used his talents we all witness on the field, to build and maintain the foundation and to insure its momentum never falters and the benefits it creates impact real people, everyday. If you have not noticed, his smile defines him. It motivates all who work beside him to be better and to always do more. Ryan is a genuine person and a person who deeply cares for others. I had heard of his passion, so when I joined the foundation I was very excited to be involved in the work that Ryan set out to do in Washington, DC. But, Richmond is my home. With the ties Richmond has to the Washington Redskins, from the training camp held here each year, to being our City’s closest professional football team, I thought it was very important that the work of the foundation reach beyond the Washington, DC market. This past year I was able to recruit another Richmond native, Shane Burnett to the Board. Together we were able to convince the Board that Ryan’s great work would not only be well received in Richmond, but a great fit due to the recent completion of the Children’s Hospital of Richmond at VCU. I was ecstatic when both the Board and the Children’s Hospital of Richmond at VCU agreed that this was a great marriage. Despite my involvement with this foundation and other charitable organizations, I have never truly appreciated the impact of the benefits from a recipient’s point of view, although I was convinced I understood. This past year during a family trip over Thanksgiving, my niece was unexpectedly hospitalized and diagnosed with a brain tumor. Celebrating her 16th birthday during her three (3) month hospital stay on the west coast, my niece was the beneficiary of many organizations and foundations such as Ryan’s. Our family witnessed first-hand the little joys, distractions, comfort and assistance these charitable foundations provided. It helped her days go by just a little easier and gave hope and promise during very difficult times. 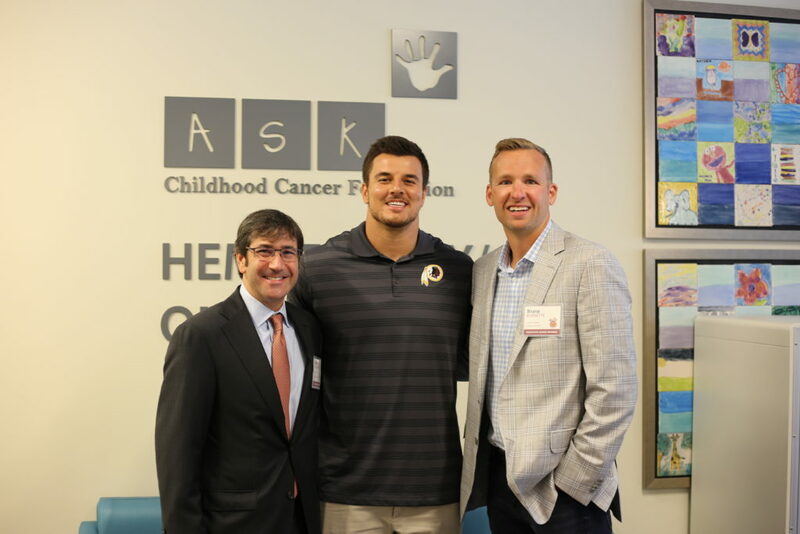 I have a new and even greater sense of appreciation for the amazing services provided by the very special facilities such as the Children’s Hospital of Richmond at VCU and foundations such as Ryan Kerrigan’s Blitz for the Better Foundation. My gratitude for what everyone has done for my niece, her parents and our family is more than my words could ever appropriately express. This is community and this is an incredible example of the positive impact created when people collaborate and work together. Thank you Ryan. Thank you to the team at the Children’s Hospital of Richmond at VCU. Thanks to everyone who gives support through their time, donations and passion to make a real difference to the great people of our community.